I have been getting very aquainted with my Zenith 35/40's lately. Photographing, and then dissasembling each section slowly and methodically. Reading various literature to try and understand how these complicated buggers work. 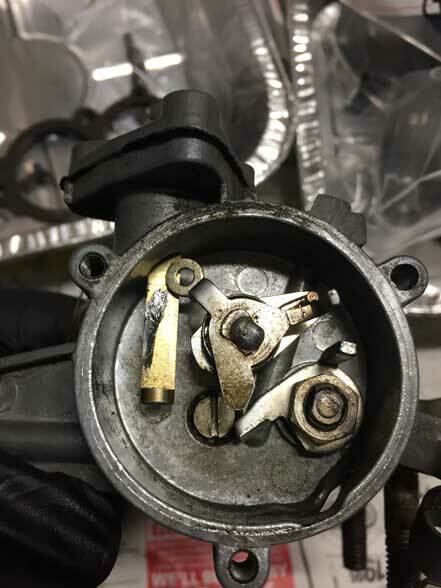 Upon removing the cover off the "Automatic starting device" I found that a tiny part seems to have snapped off and fled the vehicle. The broken part is refered to as a "stop lever" in the Merc Workshop manual. Perhaps the previous owner was a bit too enthusiastic with his "adjustment" and busted the thing off. SO.... 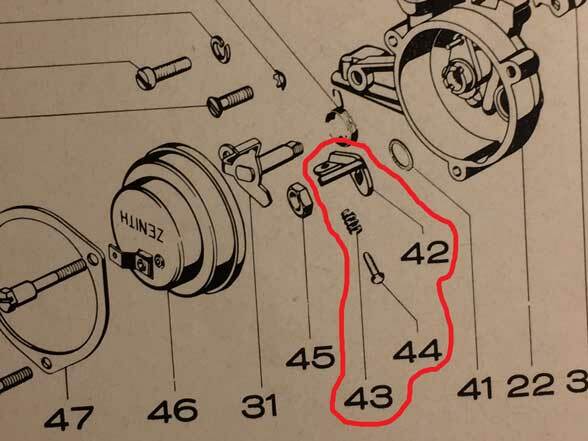 I need to replace the Stop lever(42), Compression spring (43) and Stop Screw (44) as pictured in first diagram. If any ozbenz members have these bits lying around unused, I would be eternally grateful to have them. Would rather not have to buy a whole carb just for these tiny bits, as the rest of it is in good shape. Give, so that another precious W108 can live. Silver 1969 280S - "Grace"
Re: Rebuilding Zeniths - found a broken bit - anyone got a spare? That is the adjustment for the fast idle speed when cold. So I guess it is the choke, but in reality it is only controlling the additional air, not the additional fuel. Still a very important part. 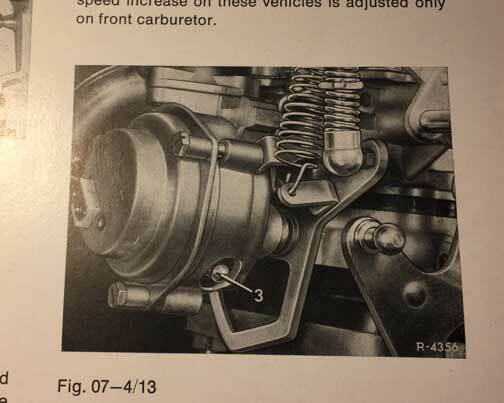 There is only 1 fast idle screw needed since both carburetors are linked together . Thanks for your reply Henry, I had wondered this. When I first got the car it seemed to drive ok. (Before I left it sitting neglected for a year). I didn't find any missing bits inside the cover. Perhaps they never were missing? The carb closest to the firewall does have it's fast idle screw. 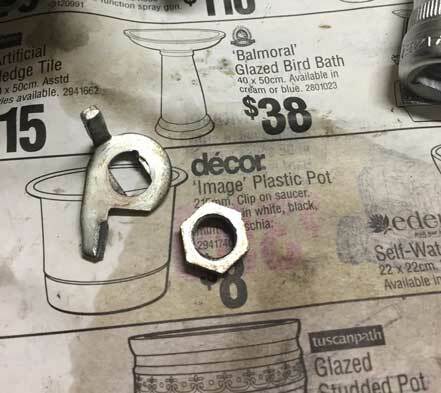 So your saying: when this screw is properly adjusted it will keep the other carb at the same fast idle setting via the linkages? It makes sense! Maybe they break the other screw off if in the Benz Factory? I think you just made my night dude! Maybe not... Yes the two are linked, but the fast idle and choke settings override the base settings that are linked together. Have a good look at how it works. 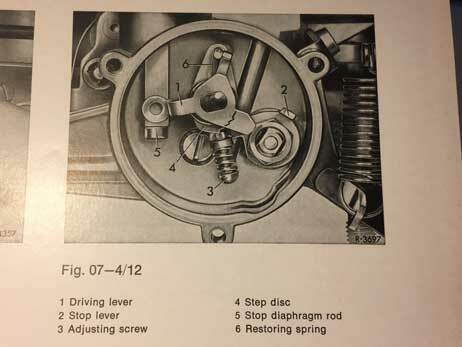 Once the choke has gone though the warm up cycle and the bimetalic spring has tightened up the idle setting is backed off until it hits the stop that is then linked to the other carb.